The head of China's top Bitcoin exchange didn't expect the Chinese government would act so soon in taking its first step to regulating the digital currency, but said he welcomed controls. "I was surprised they were so fast," said Bobby Lee, CEO of BTC China. He claims his company is the largest online marketplace in the world where people can buy and trade bitcoins. Lee was speaking on the sidelines of a presentation he gave at Stanford University on Thursday evening about Bitcoin in China. They were his first public comments since the Chinese government announced earlier in the day that it would not let banks trade in bitcoins and would require domestic traders to use their real names when registering with exchanges. Bitcoins can be thought of as digital tokens, bought and sold through online exchanges like BTC China. The currency is based on cryptographic algorithms and people either buy bitcoins with conventional currency or have their computers perform complex mathematical tasks to "mine" bitcoins. Around 12 million bitcoins have been mined to date and about 150 new coins are created every hour. That rate is continually slowing as the currency approaches its theoretical maximum of 21 million bitcoins. "The bitcoin is a special kind of virtual product, it does not have the same legal status as a currency," Chinese authorities said in an online posting earlier on Thursday. "It should not and cannot be used as a currency circulating in the market." The posting came from the nation's regulators, including the People's Bank of China and the ministry that oversees the tech sector. Lee wouldn't be drawn on the implications of the regulations. He said he hadn't had enough time to study them, but he did welcome the idea of regulating Bitcoin. "We're actually pro-regulation," he said. "We operate in the China market and we want the government to regulate the Bitcoin exchange business. We want to make this a more formal business, to have more rules in place so that we can legitimately protect the customer's interests, to protect their funds. Otherwise exchange businesses come and go, they steal customer's money, they get hacked, there are a lot of problems." The Chinese government made its announcement while Lee was on a plane heading towards the U.S. In addition to his speech at Stanford, he is also scheduled to attend a Bitcoin conference in Las Vegas next week. 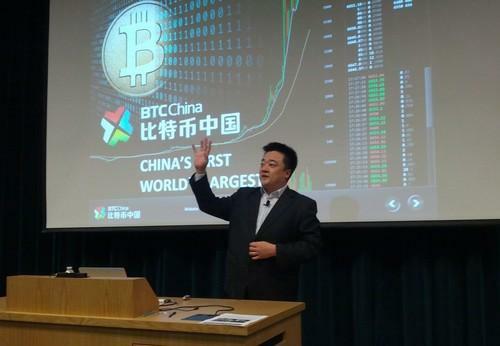 During his presentation, which had been prepared before the new regulations were announced, Lee said "the future for Bitcoin is bright in China." He cited data from his customers that showed 60 percent of people were buying or trading the coins as an investment. One third of those were looking at Bitcoins as a short-term speculative play while the remainder said it was a long-term investment. The price of bitcoins has surged in the last few months, rising from around US$200 to currently over $1,000. Lee credited the popularity of Bitcoin in China to several factors, including the high rate of savings among the population, that many people are good at math, and that Chinese consumers love to try new things.